Saarloos wolfhound is wolf-dog hybrid. Named after its crossbreeder, Leendert Saarloos, this hybrid is but 90 years old and as such – one of the youngest European breeds. Back in 1921 Leendert Saarloos wished to mitigate German Shepherd Dog's distemper by crossbreeding a German Shepherd Dog male to a female wolf and succeeding but partially. Fédération Cynologique Internationale (FCI) recognized the breed in 1981, twelve years after Saarloos' death. Today, there are only several Saarloos wolfhound breeders in Europe, and even less in the USA. The breed itself is not generally known. These hybrids are large, have wolf-like heads and movements and are very strong. Like their cousins wolves, they are highly intelligent and they cannot bark. They howl and snarl. However, breeders don't recommend them for inexperienced dog owners. Owners are usually recommended to take at least two Saarloos wolfhounds, to provide a pack. Also, this hybrid is similar to the wolf in one more aspect: if isolated, it becomes anti-social and dangerous. Examples of the owners tell us that the breed is social, faithful and loyal, unless left alone or in charge of another person. Saarloos wolfhound owners take their pets to holidays with them and never leave them isolated, caged or in boarding facilities. 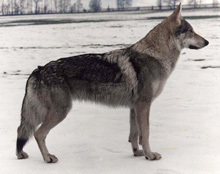 Similar to Saarloos wolfhound is Czechoslovakian wolfdog (or Czech wolfdog). They differ in one thing only: Saarloos wolfhound is crossbreed of German Shepherd Dog and Mackenzie Valley Wolf and Czechoslovakian wolfdog – of German Shepherd Dog and Eurasian Wolf. Czechoslovakian wolfdog also has wolf-like head and build, is strong and intelligent and pack-oriented. The breed became FCI standard in 1999. 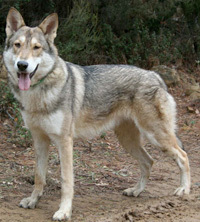 Both breeds are of wolf-grey color, sometimes mixed with brown. There are far more Czechoslovakian wolfdog breeders. In past, both hybrids were deemed dangerous, but not anymore – since all litters are result of breeding among the dogs. It is believed that the crossbreed has 30% of wolf characteristics and 70% of the dog's, but the wolf-percent decreases with generations, since no new wolf-dog mating is undergone in kennels.